Box has been on a crazy roller-coaster ride over the past 12 months. Until last year, everyone seemed to love Box, calling it the next big thing in enterprise tech. Its founder and CEO Aaron Levie was called a genius. But once Box filed for an IPO in March, things started to go downhill. Despite its huge sales growth, Box’s massive loss and spending costs turned off a lot of investors. Its filing also coincided with a market correction period when public cloud company stocks plummeted. 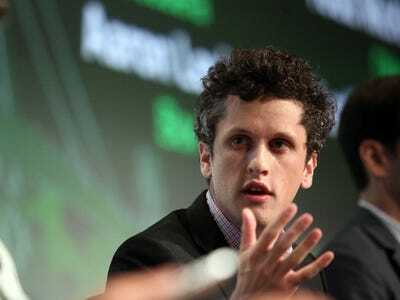 Box ended up delaying its IPO again and again. It raised more eyebrows when it opted to raise additional capital from the private market in July. Levie has largely stayed mum on these criticisms, until Wednesday, when he spoke to The Information about it. He says Wall Street is “still trying to figure out how to value high-growth tech companies,” especially with the way they make investments. Traditional accounting is flawed for SaaS business: In traditional accounting, you don’t recognise the revenue until the actual service is delivered. But SaaS business is a subscription model. In other words, even if you win a three-year subscription contract worth $US1 million, you can only record a third of that sale, or $US333,333, as the first year’s revenue. The rest would recur over the next two years, but you don’t recognise it in the books until the service actually delivers. However, you still have to account for the full sales and marketing cost that went into getting that $US1 million contract in the first year. So even if it looks like you’re spending a lot relative to revenue, part of the sales and marketing cost is going toward growing that revenue (plus, you have a guaranteed amount in recurring revenue). SaaS investors like to use a metric called “Magic Number” instead, to account for this discrepancy, and Box’s annual magic number looks pretty solid compared to the median number. You can cut down on sales and marketing once you reach scale: Zuora CEO Tien Tzuo nailed it in this post, but Box would still have a 20% recurring revenue margin, even if it stopped all sales and marketing today. The sales wouldn’t grow anymore, but just based on its recurring subscription contracts, Box would still be a profitable company. Box is roughly spending $US2 to acquire $US1 of growth, according to Tzuo, but that $US1 would recur for the next 5 to 10 years, which makes Box a great business. Levie probably thinks Box has grown enough that he could now cut down on its sales and marketing costs. In fact, in The Information article, he does say those investments “were the highest relative to the revenue scale” when he filed the S1 in July. And with less spend on sales and marketing, Box’s bottom line would obviously improve immediately.